TOWER, Minn. — Applying local knowledge on unfamiliar tournament water is a risk sometimes worth taking. 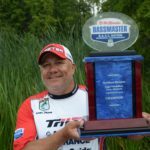 Doing just that paid off for Wisconsin’s Gary Adkins, winner of the Old Milwaukee B.A.S.S. Nation Northern Divisional on Lake Vermilion. The Green Bay angler caught 48 pounds, 4 ounces, after three days of fishing under a variety of weather conditions. Minnesota’s Corey Brant, the leader after two days and presumed favorite to win, finished second with 45-15. Another Wisconsin team angler, Ryan Whitacre, earned third place with 43-2. Adkins, Brant and the leaders from the other six Midwestern states participating in the tournament advance to the Old Milwaukee B.A.S.S. Nation Championship. The event is bass club fishing’s premier event, with an international field of anglers competing in November on the Ouachita River in Louisiana. 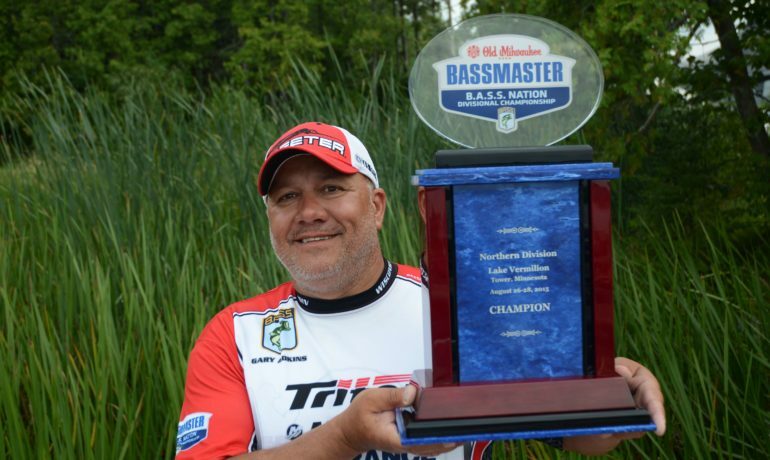 Adkins found striking similarities between his home water of Lake Michigan and the northern Minnesota tournament fishery. What he found is a combination of gravel bottom mixed with the large boulders that form most of the smallmouth habitat. Adkins keyed on one particular rock and gravel formation rising from 30 to 15 feet off the bottom. The sharply defined dropoff was a wise choice after a cold front pushed through the area on Day 1. Adkins chose a green/pumpkin pattern Get Bit Slender Tube inserted into a 5/16-ounce jighead for fishing the sloping contours of the gravel bottom. The key attractant was crawfish being fed upon by the smallmouth. Later in the day he moved to a rocky shoreline offering yet another similarity to his home water. Most shorelines on Lake Vermilion feature sharp drops into deep water. Instead, Adkins chose a gently sloping shoreline that created warmer water. Adkins chose a square billed PH Custom Crankbait that matched the size and action of the crawfish for the afternoon bite. Each day began on the gravel side of the rocky shoal. Later in the day he moved to the shoreline to fill his limit. Advancing to the national championship are these remaining state winners. They are: Greg Vance (Iowa); Dan Brown (Illinois); Dave Watson (Indiana); Jeff Fischer (Michigan); Jami Fralick (South Dakota) and Nick Leonard (Ohio). Minnesota won its third consecutive state title with a total weight of 456 pounds, 11 ounces. Wisconsin was second with 401-11 and Illinois placed third with 372-4. Ohio took fourth place with 336-12 and Indiana was fifth with 318-12. South Dakota earned sixth place with 310-12 and Michigan was seventh with 295-10. Iowa finished eighth with 286-12. Minnesota’s overall score received a huge boost from its team competing in the Costa B.A.S.S. Nation Northern Division High School Divisional. Mason Raveling and Ben Provost weighed 34-8 to also take first place in the high school contest. The anglers are from Prior Lake High School. Minnesota received a Triton boat, powered by a Yamaha outboard and rigged with accessories. The package is valued at $37, 292. Corey Brant earned the $250 Livingston Lures Leader Award as Day 2 leader. Andy Hriber received the $250 A.R.E. Top Angler Award as highest placing angler using the brand’s truck caps.